Kenneth Grahame’s The Wind in the Willows has been brought back to life and will feature illustrations by EMLA client, Clint Young. The continuing story of Toad, Mole, Ratty, and Badger returns in the tentatively titled The Willows Redux, written by Jacqueline Kelly, whose 2009 debut, The Evolution of Calpurnia Tate, was a Newbery Honor book. The Willows Redux will be published by Holt Books for Young Readers and edited by Laura Godwin, vice president and publisher of the imprint. The novel is schedule for a fall 2012 release to coincide with a film adaptation of The Wind in the Willows to be directed by Ray Griggs from RG Entertainment. What especially caught Kelly’s attention was Young’s drawing of Toast, a pig character who is the star of his debut picture book, The Wish Collector, which is under contract with Feiwel and Friends but does not yet have a pub date. “Clint has a lovely kind of naturalistic art, and this little pig character has a spark of life and humor to it that I just loved—and wanted for my characters,” the author says. Congratulations to both Clint and Jacqueline! Joshua McCune’s debut KISSING DRAGONS, set in a future where dragon wars have shaped society, a seventeen-year-old girl becomes caught in a deadly conflict of loyalty between the dragon resistance and the government forces who are trying to wipe them out, in a three-book deal, to Virginia Duncan at Greenwillow by Ammi-Joan Paquette at Erin Murphy Literary Agency (NA). Huge congrats to you, Joshua! As if having her latest book trailer played on the Jumbotron at a baseball stadium over the weekend, preparing for her second picture book starring a buffalo to hit shelves, and anticipating the release of her first novel this fall isn't enough, Audrey Vernick has even more to celebrate: A new book deal! 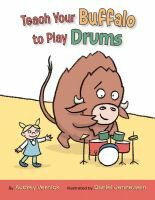 TEACH YOUR BUFFALO TO PLAY DRUMS and SHE LOVED BASEBALL author Audrey Vernick's BOGART & VINNIE: A COMPLETELY MADE-UP STORY OF TRUE FRIENDSHIP, wherein Vinnie, a crazy-happy dog, finds a most unlikely companion when visiting a nature preserve, to Stacy Cantor Abrams at Walker Children's. Stacy at Walker is also the editor of Audrey's forthcoming picture book SO YOU WANT TO BE A ROCK STAR, illustrated by Kirstie Edmunds, which debuts this winter.